Despite the need for more fuel economy and better alternatives to the gas-guzzling super-hog SUVs, there are still drivers out there who need the additional space those monsters provide. Thankfully, there are alternatives to the mammoth sport utes, and many of them come with very good fuel economy to boot. The real need here is for space; we’ll say space in the neighborhood of seven passengers. And, since we don’t have the extra coin floating around with the holidays rapidly approaching, we’ll be hitting the used lot. That brings us to researching the automotive experts at Consumer Reports, Edmunds, Motor Trend, and J.D. 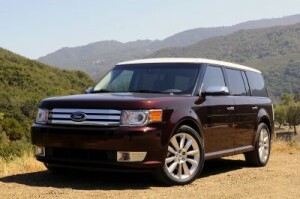 Power & Associates, to find you the best used 7-passenger vehicles. If you’re looking for space, comfort and reliability, you need to look no further. The Toyota Highlander offers all you ever need. 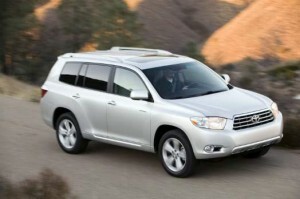 “It is a competent, refined, family-focused SUV that offers great practicality, cargo and passenger versatility, and evident quality.” (Consumer Guide) The only real knocks against the big SUV are its boxy exterior styling (unsuitable for some who prefer the new rounded models), and the use of some questionable materials in the interior. However, power, performance and comfort are at a premium. You can’t go wrong in any of these model years. Hyundai has been steadily climbing the automotive ranks for years, and the Veracruz is one of their latest achievements. “Equip the Veracruz properly, and it has the mojo to compete with the higher-priced vehicles.” (Motor Trend) It possesses five-star safety features, and shines for the low price accompanying it. Find any of these model years and you’ll enjoy the remainder of the 5-year/60,000-mile manufacturer’s warranty as well as the 10-year/100,000-mile powertrain warranty. It also offers more space than any other vehicle in its class. Don’t be fooled by Toyota’s lack of exterior styling, they are on this list twice for a reason. The reliability standards exhibited by Toyota over the past decade have been incomparable, and the Sienna is one of those steadfast treasures in any of the above model years. 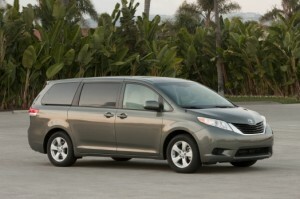 “If one needs a lot of passenger and cargo room – and no one would buy a minivan if they didn’t – then the Sienna gets our vote as one terrific family car.” (Forbes) Unlike its Highlander cousin, there are no questionable interior materials as the Sienna offers spaciousness, practicality and a feeling of quality in any trim level. If you’re one of the people who can move past its boxy styling, the Flex offers some of the best practicality available in a seven-passenger vehicle. The cabin is one of the most comfortable in its class, and the flat-folding seats make hauling large cargo much easier than in your standard minivans or SUVs. As with most of Ford’s lineup, family-friendly features abound, including a second-row refrigerated console that works perfect for those days when family picnics or long road trips are in order. The CX-9 is the largest of the Mazda SUV lineup, and it is the king for this Japanese manufacturer. “For those who find themselves being dragged kicking and screaming out of their sporty sedan toward a family hauler, there’s quite simply no better choice than the Mazda CX-9.” (Edmunds) Not only does it possess some of the best features of any of its competitors, it also scores a spectacular nine out of ten in J.D. Power and Associates reliability studies. The one knock against it is the standard 3-year/36,000-mile warranty, which will be expired for any used models from the 2008 model year.